This annual commemoration of the foiled 1605 Gunpowder Plot, whereby a group of Catholics, including Guy Fawkes, attempted to assassinate the Protestant King James I by blowing up the Houses of Parliament in London, involves the burning of effigies representing Fawkes on bonfires, as well as fireworks displays (aptly reflecting Fawkes’s role in keeping charge of the explosives). The Plot was uncovered when the authorities were tipped off by an anonymous letter and searched the undercroft beneath the House of Lords in the early morning of 5th November, where they discovered Fawkes safeguarding a stockpile of gunpowder – hence the traditional recitation of ‘Remember, remember, the fifth of November’, which has endured from the ditties of the time. Under a torturous interrogation, Fawkes revealed the names of his co-conspirators, and was sentenced to death by being hung, drawn, and quartered (although he managed to break his neck on the noose, thereby avoiding most of this ordeal). Fawkes has therefore come to be principally associated with the Plot, and so Bonfire Night is alternatively known as Guy Fawkes Night. There are a number of organized fireworks displays planned around the event. The Scottish Love in Action’s (SLA) Fireworks Extravaganza has 2 showings on 2nd November at George Watson’s Rugby Ground on Myreside Road; gates open for the Blue Show at 4.10pm, with the Show running from 4.30pm-5.15pm, while admission to the Red Show is from 6.40pm for a 7pm start, culminating at 7.45pm. The programme of entertainment includes Edinburgh Rock Choir, the Delighters Fire Circus Theatre, and either the George Watson’s College Pipe Band (Blue Show) or the Edinburgh Academy Pipe Band (Red Show). Tickets for both shows cost £26 for a family ticket (2 adults and 2 children – under 2’s are admitted free) and £7.50 for a single ticket. Tickets for the Blue Show can be bought online here and the Red Show here. The Meadowbank Annual Firework Display is scheduled for 5th November at the Meadowbank Sports Centre, and this year has a superhero theme. Doors open at 6pm, with the show getting underway at 6.30pm, and the fireworks display commencing at 7.30pm. Tickets cost £6.50 plus a minimum booking fee of 50p (dependent on value of tickets purchased) and can be ordered online here, or by calling the Box Office on 0131 661 5351. Visitors to this Fair will be able to view the mainstays of any wedding showcased by over 130 exhibitors. From its beginnings in 2003, the Fair has procured wedding products and services for attendees to peruse, from bridalwear, groomswear, flowers, stationery, wedding cakes, and favours, to vintage cars, venues, photography, entertainment, and room arrangements. Wedding coordinators will be on hand to discuss your requirements, and drinks will be available at the Concourse Bar. A Fashion Show will also feature, adding hair, makeup, and jewellery to the spectacle. Discounts are offered by many suppliers, including 20% off wedding receptions at the Corn Exchange booked during the Fair. Tickets can be purchased for £5 online here, or for £7 at the door, with under 16’s admitted free of charge. Through collaboration with Scotland’s various historical institutions, this festival aims to highlight national history through talks, exhibitions, readings, guided tours, and more. The extensive programme, which includes both free and paid events, spans a range of Edinburgh venues (and even other cities!) and can be found online here. From its beginnings as the Contemporary Art Fair Edinburgh in 2005, this art show was rebranded as the Edinburgh Art Fair the following year, and has gone from strength to strength, having now attained the accolade of being Scotland’s largest annual art show as it celebrates its 10th year. Organizers Arte in Europa spotlight both eminent and emerging talent from across Europe at the Edinburgh Corn Exchange, and this year’s Fair will have a marked cosmopolitan emphasis, with representation from Ireland, India, and inaugural showings of artists from Poland and Australia. Street art will also feature, with Edinburgh’s own ‘The Too Much Fun Club’ creating a 7-metre long mural during the Fair. Thursday night will be a preview evening running from 6.30pm-9.30pm, during which visitors can also bid on a charity art auction in support of Breakthrough Breast Cancer. Tickets for the Fair can be bought at the door or from one of its sponsored charities, specifically the East Lothian Special Needs Playscheme, St Columba’s Hospice, and Art in Healthcare (you can specify your preferred beneficiary when you purchase your ticket at the Fair). Preview evening tickets cost £10, and tickets purchased on any day are effectively weekend passes, conferring unlimited access to the Fair, which runs from 11am to 6pm on Friday and Saturday, and 11am to 5pm on Sunday. Tickets purchased on these days cost £5 (£3 concessionary rate, applicable to senior citizens, full-time students, and people in receipt of jobseekers allowance or income support – proof of concessionary status must be shown at the Fair). Artist demonstrations and painting, print- and jewellery-making workshops will also run alongside the exhibitions; they are covered under the cost of admission, but places in some must be booked, so if you’re interested, see this page. Drawing on Gregory Maguire’s 1995 novel, Wicked: The Life and Times of the Wicked Witch of the West, and its forerunner, L. Frank Baum’s The Wonderful Wizard of Oz, published 5 years earlier, Wicked explores the relationship between Glinda and Elphaba when they first meet as sorcery students at Shiz University. The story follows the very different paths they take after encountering The Wonderful Wizard of Oz; ones which establish the dichotomy between Glinda The Good and the Wicked Witch of the West. Shows run at Edinburgh’s Playhouse Theatre (18-22 Greenside Place) at 7.30pm Monday to Saturday, with matinees, or afternoon shows, on Wednesdays and Saturdays at 2.30pm. Each performance lasts 2 hours and 45 minutes, with a 20-minute break. Additional matinees will figure on December 18th, 23rd, 28th (special in being a Sunday), 29th, and 30th, as well as the 2nd and 8th of January. There will be no matinees on the 19th of November or Hogmanay, and no performances on Christmas Eve, Christmas Day, Hogmanay, or New Year’s Day. Prices range from £20 to £75 per ticket depending on the date, the category of seat selected, and the number of tickets purchased. School groups also receive a special rate on certain days. A £4 transaction fee applies to tickets purchased online and over the telephone, although the fee is waived for group bookings and theatre card members. Don’t forget that we can offer a discount of around £5 off tickets purchased through us, so drop us a line via info[at]greatbase.co.uk to save yourself some money. Wicked has accrued a spate of international awards and is recommended for an audience aged 7 and above (infants under 3 years of age are not admitted). Performances feature loud noises, flashing lights, smoke effects, and strobe lighting. 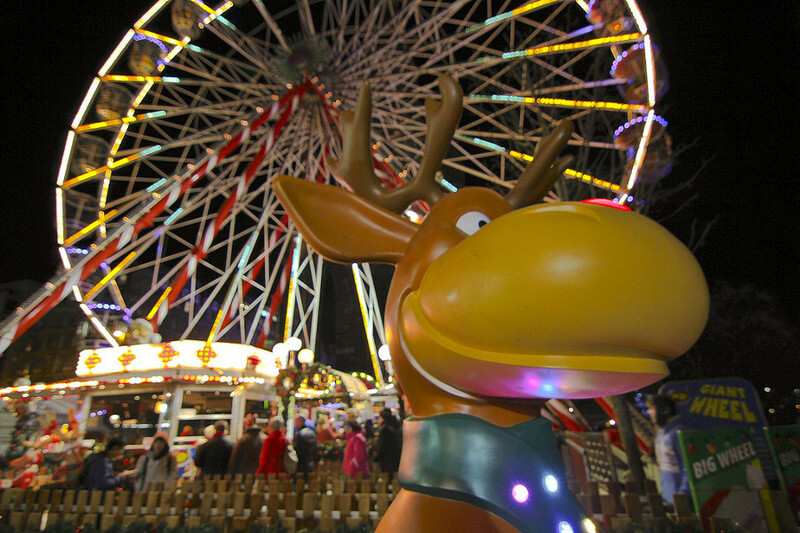 Edinburgh’s Christmas is a diverse range of events spanning 6 weeks of the Christmas season, and located in St Andrew Square and East Princes Street Gardens. It comprises shows in the famous Spiegeltent, ice skating, markets, and rides, including the landmark Big Wheel and the 60-metre-high Star Flyer, both of which offer vistas over the city. For full details on all that’s happening, see here. Edinburgh’s Christmas activities also encompass some of those for St Andrew’s Day on 30th November, which has been a Bank Holiday in Scotland since 2006 (although it’s left to employers’ discretion whether to give their staff time off). To present them with the opportunity, the Bank Holiday falls on the first Monday of December if the 30th of November lies over a weekend (so this year, the Bank Holiday will be on Monday 1st December). Celebrations on the 30th include free admission into Edinburgh Castle and entertainment in the Spiegeltent in St Andrew Square, as well as free skating sessions on the ice rink. 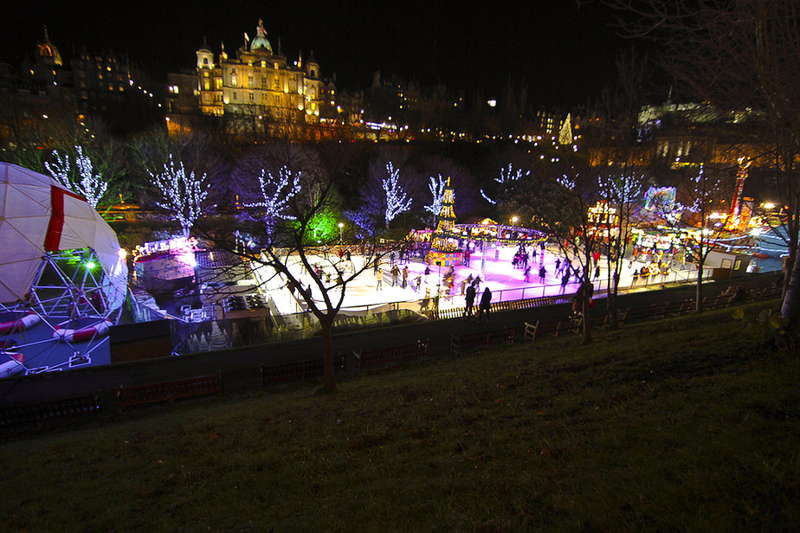 Some of the Edinburgh’s Christmas activities arranged for the day, including the skating, is ticketed and must be booked in advance. You can review the full programme of activities in the Square and book tickets here. This annual literary celebration sees a raft of book-themed events across Scotland over a week in November. The programme unites authors and illustrators with their readerships in libraries, schools, workplaces, community centres, and arts venues for a variety of events. As well as the Edinburgh events programme, a series of auxiliary promotions are planned for the occasion: Stockbridge library has been selected to host 1 of 5 specially-commissioned artworks from creative studio Pidgin Perfect, inspired by the poem ‘Dear Library’ by Jackie Kay; organizers The Scottish Book Trust have created a series of Scotland-centric reading lists for those who want to explore our national backdrop across a range of genres (there’s also one for books set in Edinburgh), and they’re seeking our favourite Scottish literary character – you can vote for, or nominate, yours here any time before 5pm on Wednesday 26th. They’re also soliciting reading pledges for the week, with the chance of winning a Nexus tablet. As usual, we’ll provide reminders and ongoing coverage of several of these events on our Facebook and Twitter channels, so follow our accounts to stay up to date. Finally, let us know what you’re planning to do in Edinburgh this November using the comments function, and stay tuned to this blog for future entries in the series and more besides.